The term luminescence is used to describe a process by which light is produced other than by heating. The production of light from heat, or incandescence, is familiar to everyone. The Sun gives off both heat and light as a result of nuclear reactions in its core. An incandescent lightbulb gives off light when a wire filament inside the bulb is heated to white heat. One can read by the light of a candle flame because burning wax gives off both heat and light. But light can also be produced by other processes in which heat is not involved. 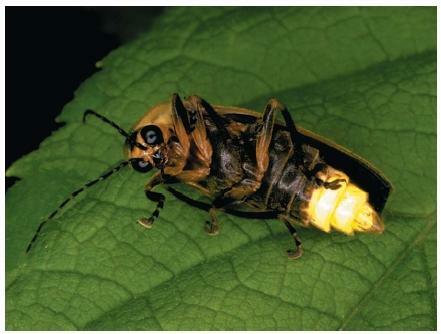 For example, fireflies produce light by means of chemical reactions that take place within their bodies. They convert a compound known as luciferin from one form into another. As that process occurs, light is given off. Two forms of luminescence can be identified, depending on the amount of time emitted light continues to glow. By definition, fluorescence refers to the release of light that lasts no more than about 10 nanoseconds (10 billionths of a second) after it begins. Phosphorescence refers to the release of light that lasts longer than 10 nanoseconds. Substances that glow in the dark have many practical applications today. Clocks and watches, for example, often have their numbers and hands coated with phosphorescent paints so we can see what time it is in the dark. Emergency doors and stairways are also highlighted with these paints so that people can find their way out in case of a power failure. Probably the most familiar form of fluorescence is a fluorescent lightbulb. Fluorescent light is produced when an electrical current passes through mercury vapor in the lightbulb. Electrons produced from the mercury vapor collide with a chemical painted on the inside of the bulb, causing fluorescence. The moment the bulb is turned off, however, the chemical stops glowing. The light produced by this process, therefore, is an example of fluorescence. Fluorescence: Luminescence that stops within 10 nanoseconds after an energy source has been removed. Incandescence: Light created by heating. Incandescence is not a luminescent process. Phosphor: A material that absorbs energy over some period of time, then gives off light for a longer period. Phosphorescence: Luminescence that continues for more than 10 nanoseconds after an energy source has been removed. Many people have seen minerals that are phosphorescent. Once exposed to light, they continue to glow for many minutes after being placed into a dark room. The longer glow time defines these minerals as phosphorescent. The changes that take place in atoms during luminescence are the same as those that occur during incandescence. Electrons in atoms absorb energy from some source and jump to a higher energy level. After a fraction of a second, the electrons fall back to their original level, giving off the energy they had previously absorbed. Various procedures can be used to get this process started, that is, to get electrons to jump to higher energy levels. In incandescence, the process is heating. In luminescence, it can be any one of a number of other processes. In chemiluminescence, for example, some chemical reaction occurs that gives off energy. That energy is then used to excite electrons and produce luminescence. Many students are familiar with devices called cyalume sticks. When one of these sticks is broken, two chemicals are released and begin to react with each other. The energy released during that reaction produces luminescence that can last for many hours. Bioluminescence is a kind of chemiluminescence in which the chemical reaction involved takes place within a living organism. The example of light production by fireflies is an example of bioluminescence. Electroluminescence occurs when an electric current passes through a material, causing the material to glow. Many flat-panel displays on electronic equipment, such as those on laptop computers, contain electroluminescent systems. Less common examples of luminescence are those produced by sound energy (sonoluminescence) and by friction (triboluminescence). more application and uses this topic you send me. phosphorescence function and work (or)any experimental you explain. Current version of the article states that light in fluorescent bulbs "is produced when an electrical current passes through mercury vapor in the lightbulb. Electrons produced from the mercury vapor collide with a chemical painted on the inside of the bulb, causing fluorescence." This is incorrect, as electrons collide with mercury atoms which in turn emit light - albeit mostly in the ultraviolet range. Some of this light (photons, that is) is then absorbed by the fluorescent coating on the inside of the bulb, which fluoresces in the visible range. Without the fluorescent coating you would have a simple mercury-vapor UV lamp. Fluorescent coating fluoresces not because of the electrons hitting it, but because of the UV light that excites it. I want to know how are luminescent and LED light bulds are the same. How can I make things glow in the dark useing household items?